In 1963, Herbert Gilbert came up with the idea of the first “smokeless cigarette.” This was, technically, the very first electronic cigarette ever designed. The electronic cigarette patented by Gilbert did not use tobacco. 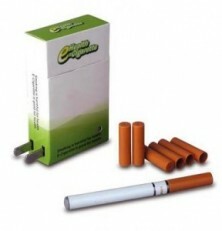 The product still delivered the same nicotine level, but instead of tobacco a nicotine solution was created and used in the device. As the device heated the solution, the water became vapor. The vapor produced steam. This allowed the user to breathe in nicotine, to get the same feeling they had when smoking, without the harmful effects of tobacco. At the time cigarette use was ubiquitous, with around 50% of adults partaking and most believing tobacco was relatively harmless. The first Surgeon General’s report hadn’t even been published yet. But Gilbert is said to have created his electronic cigarette because he saw what he considered to be an overuse of tobacco. Believing that tobacco was not good for the body, he set out to find a delivery method for nicotine which didn’t require the use of tobacco. Various manufacturers approached Gilbert to discuss the manufacturing of the electronic cigarette. However, no actual contract or distribution ever came to fruition. Many believe that this was because of large-scale social acceptance of smoking and the lack of overall concern that smoking was a health risk. As a result, by 1967, the device was no longer discussed as a viable product and there was no public mention of a “smokeless cigarette” for many years. The next time the smokeless cigarette appeared was in 2003. At that time, a Chinese pharmacist named Hon Lik created a similar product. Credited as the modern inventor of a usable electronic cigarette, he designed a device more complex than the original version created decades before by Gilbert. Hok Lik’s device used a piezoelectric ultrasound emitting element. Once the device was activated, it created an electric charge. The charge built up in solid materials, including crystals and proteins. Whenever it was activated, the charge worked to vaporize a pressurized jet of liquid. This liquid was a nicotine solution, with a small amount of nicotine diluted in a propylene glycol solution. A few things stood out in this version of the electronic cigarette. It did use a solution containing nicotine just as Gilbert’s did. However, the vapor produced looked very much like traditional cigarette smoke. The user was able to breathe in this vapor, bringing the nicotine into their lungs and later into their bloodstream, providing a very similar experience to traditional smoking. To improve the electronic cigarette further, Hon Lik devised a method that allowed him to put the propylene glycol/nicotine solution into a plastic cartridge. When the user finished using the device and the solution was gone, he could simply toss out the cartridge instead of the entire device. This unique design is still one of the most important components in the design of today’s electronic cigarette. The rapid success of the e-cigarette was certainly helped by the fact that the company Hon Lik worked for supported his research and helped in the production of the product. By May of 2004, Hon Lik’s device was on the market in China, marketed to those who were trying to quit smoking. Advertising campaigns focused on the e-cigs being a “healthier” option than traditional smoking. A year later, the company began international export of the electronic cigarette. By 2007, the company held international patents for the product. The company Hon Lik worked for was originally called Golden Dragon Holdings. It later changed its name to Ruyan, which means “resembling smoking” in Mandarin. Today, Ruyan is the largest manufacturer of electronic cigarettes in the world. Unlike that of Gilbert, the new version of the electronic cigarette caught the public’s imagination quickly. This was largely because of of the overwhelming medical evidence on the hazards of smoking, which simply didn’t exist in Gilbert’s day. That meant there was a ready-made market for a cigarette alternative, whether it was among smokers wanting to quit, or those searching for a way to still “smoke” in a world where that was becoming more and more difficult. And many potential manufacturers were quick to realize the potential profits to be realized; they quickly jumped on the bandwagon. In Europe, e-cigs became very popular and readily available. And a few years later when the United States allowed the importation of electronic cigarettes from Chinese manufacturers, the market grew even faster. In fact, electronic cigarettes have become the fastest growing segment of the smoking industry in America. In 2010, estimates indicate that about 750,000 units were sold in the United States. In 2012, that number hit 3.5 million. Exponential sales growth has been seen in Europe, and around the world, as well. This soaring demand is certainly one factor in the debate over regulation of electronic cigarettes. In fact, some credit the demand in Europe as a major factor in the EU Parliament’s decision not to regulate e-cigarettes as medical devices – since such regulation would make it much harder to buy ecigs. With the e-cigarette industry still in its relative infancy, all indications are that demand will continue to grow, even if laws and ordinances make it more difficult to purchase or use the products.